Becca is the daughter of one of my cyber friends. For those of you who have been through my site, you should have noticed that on the page titled photo album I have a picture of Dorn with her first elk. Dorn is Becca's mother. 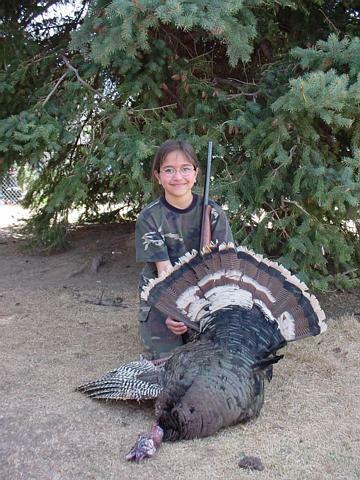 I received an email from Dorn telling me about Becca's turkey hunting this spring (2002) and that Becca was successful in harvesting her first turkey. So I told Dorn that if Becca would write the story of her hunt in her own words, I'd make a page on my website just for her to tell her story. So please read on for the story and pic of Becca and her gobbler. Great job Becca! with my dad and my 3 big brothers Gabe, Zack and Art. were toms so we couldn't shoot them. On Day 2 Dad made us get up even earlier, at 3:30. It felt like I just went to sleep when he woke me up. fell over and didn't get back up. didn't see it but I told him where I heard it from. wasn't gone too long when I heard the shotgun go off. say it was 21. His only weighed 19 pounds. couldn't believe that I had shot their turkey! got the biggest turkey, and they didn't get anything. elk, but I have to wait until I am 12. By Rebecca Lee Navakuku as told to her mother.